What is most notable about Dissidia Final Fantasy Omnia is the fact that there is no PvP, no timers, and no stamina system. So despite the fact that this is an FTP gacha RPG with plenty of in-app purchases that range up to $74.99 per item, there should be little reason to worry about any pay-to-win shenanigans. Sure, players can still spend a bunch of their money to get a jump over those that play for free, but at the very least it won't affect anyone else's enjoyment of the title. Heck, those that pay into the game will actually be a big help to free players thanks to the fact that the multiplayer aspect is cooperative. 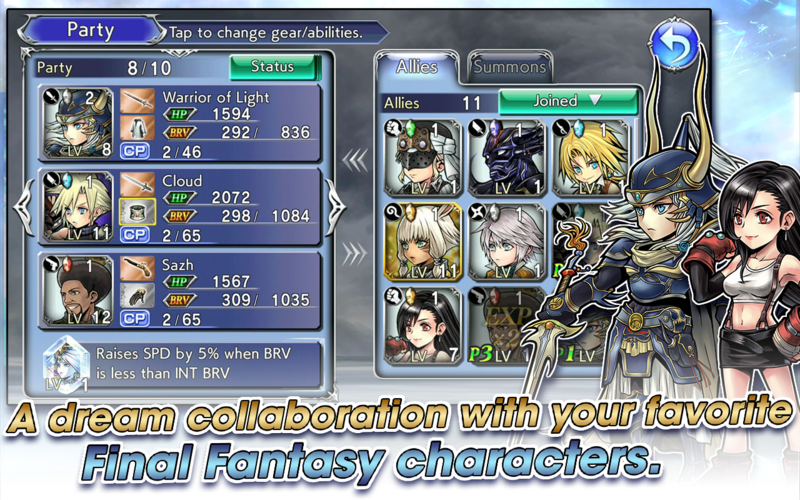 For the most part, the gameplay works the same as any turn-based RPG. Your team of heroes will have a selection of moves, some that will break your enemies defensive abilities, and some that will do more damage to HP while your enemies defenses are depleted. It takes a minute to get this system of switching from offensive to defensive attacks down if you have never played a Dissidia game before, but once you do it should be smooth sailing. So yeah, there you have it. If you are looking for a new turn-based RPG to play through, one that has a pleasant cooperative setup, Dissidia Final Fantasy Omnia actually appears to be a solid choice. Free players can simply ignore the numerous IAPs since they don't really affect them, and those that want to spend their money on IAPs can do so freely without it bothering anyone else. This seems like a win-win to me. Who would have thought Square Enix had it in them? 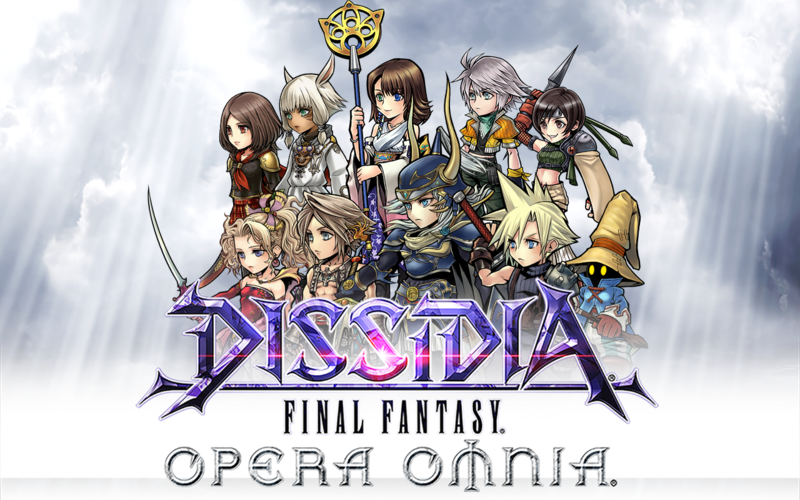 DISSIDIA® FINAL FANTASY® OPERA OMNIA ™ is now available as a free download from the App Store for iPhone and iPad and Google Play for Android devices. 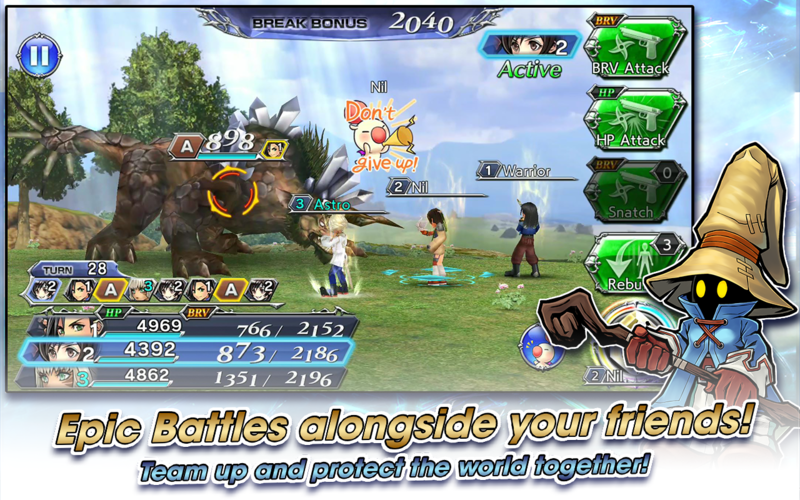 Players can experience the world of DISSIDIA FINAL FANTASY on mobile devices by forming parties from dozens of legendary FINAL FANTASY heroes and villains, and battle across an extensive original storyline. The game features strategic turn-based combat and a variety of weapons to be used in battle. Pre-Registration Reward - Following the large number of fans who took part in the pre-registration campaign, all players who log into the game before February 28 will receive 5,000 in-game gems, a valuable in-game currency. Login Bonus - Throughout the month of February, players can collect 300 gems each day for up to 20 days (6,000 gems total) just by logging in. All-Stars Draw - The "All-Stars Draw" features gear for the 25 playable characters available at launch. 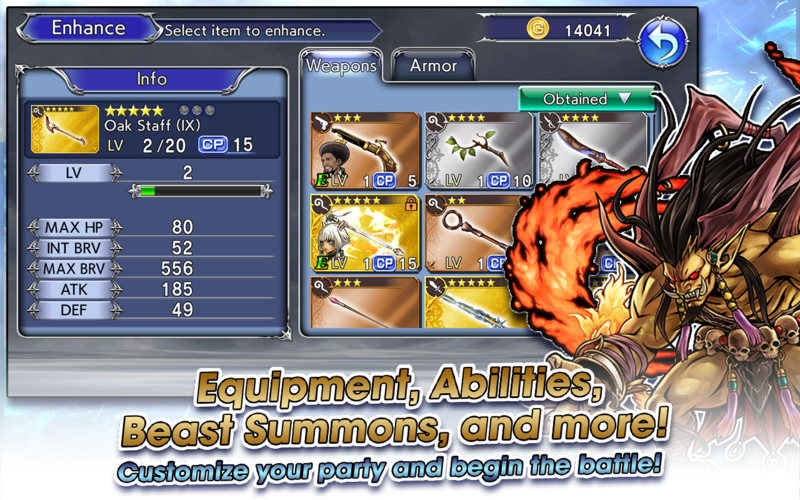 The first summon is half-priced through February 28, and players are guaranteed one five-star rarity weapon. 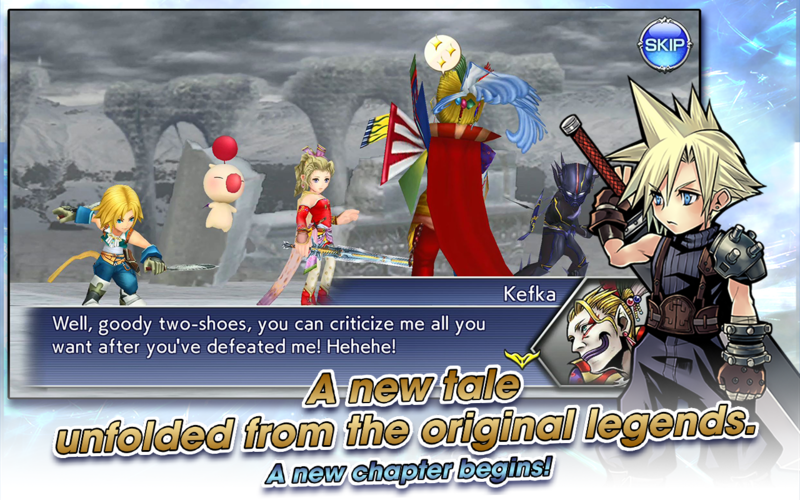 DISSIDIA FINAL FANTASY OPERA OMNIA is now available in the App Store for iPhone and iPad and Google Play for Android devices. For the latest assets and screenshots, please visit the press site at http://sqex.to/Media. DISSIDIA, the DISSIDIA FINAL FANTASY logo, FINAL FANTASY, the FINAL FANTASY logo, OPERA OMNIA, CRYSTAL DYNAMICS, DRAGON QUEST, EIDOS, SQUARE ENIX, the SQUARE ENIX logo, TAITO and TOMB RAIDER are registered trademarks or trademarks of the Square Enix group of companies. All other trademarks are properties of their respective owners.